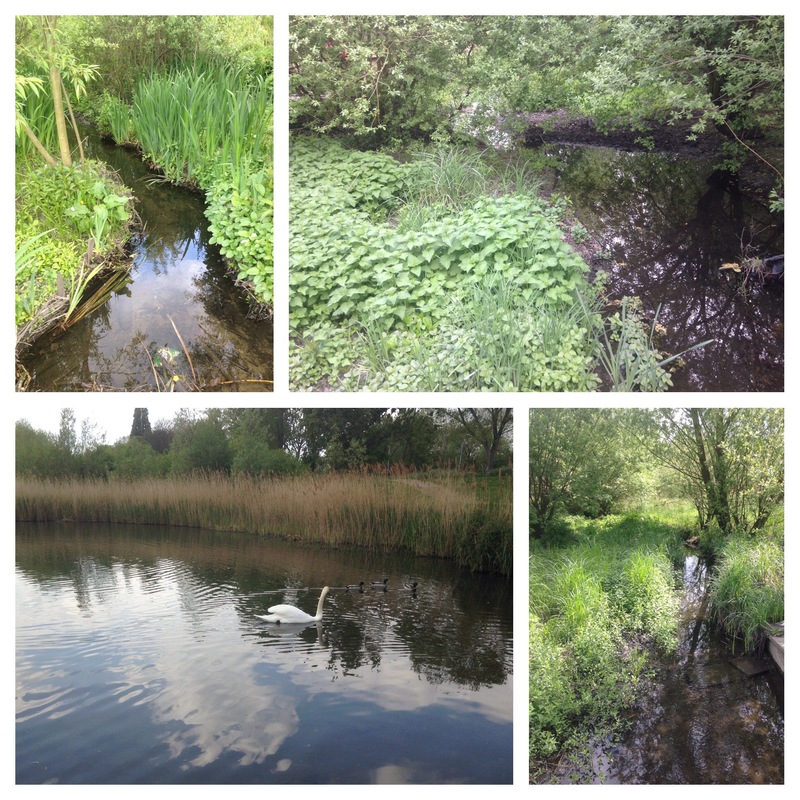 In previous posts, Running Past has followed the Quaggy from its sources around Locksbottom and then on through Petts Wood, the Hawkwood Estate, Chislehurst and Bickley, through the golf courses of Sundridge Park and on to Chinbrook Meadows. Most recently, we left he river at on the south side of Eltham Green Bridge, by an old London County Council sign, wondering about how to moor a boat there. 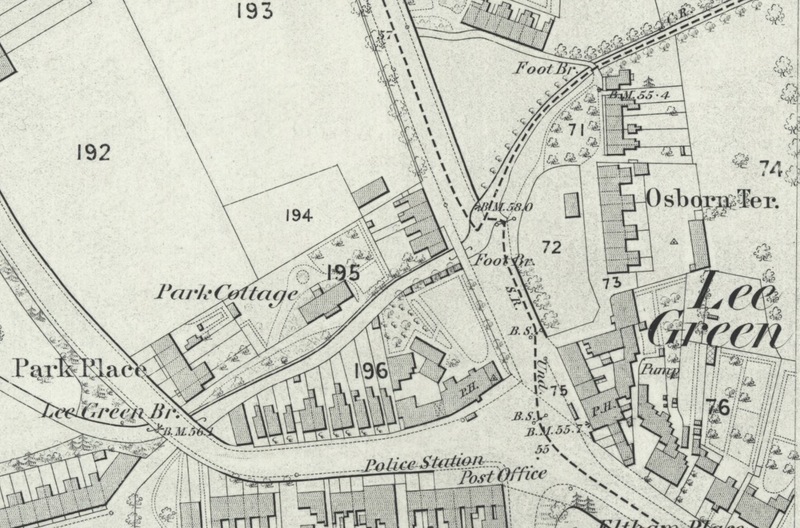 North of the bridge, over Eltham Road, is Sucliffe Park; until the early 20th century the area was farmland, The Quaggy meandered through the fields as the map below shows (on a Creative Commons from the National Library of Scotland). Woolwich Borough Council acquired the land just after World War 1. It was named after the then Borough Engineer (1). The meanders had been removed by the time that the Ordnance Surveyors cartographers visited again in 1938 and encased in concrete – as the map below shows (on a Creative Commons from the National Library of Scotland). The river was completely enclosed at some stage during the post war period, Ken White believed it to be around 1970 (2) although several on Facebook threads thought it was much earlier than this. In Facebook threads on upstream posts, there were lots of memories of playing in the Quaggy and culverts around the Park, seemingly including some of the streams that join the Quaggy – notably Well Hall Stream. This all changed in 2002. A new meandering channel was created for the Quaggy, close to its pre-1930s course, albeit at a slightly lower level, with the park itself being remodelled to create a flood plain able to store 85,000 m³ with a series of boardwalks, viewing points and a large pond. 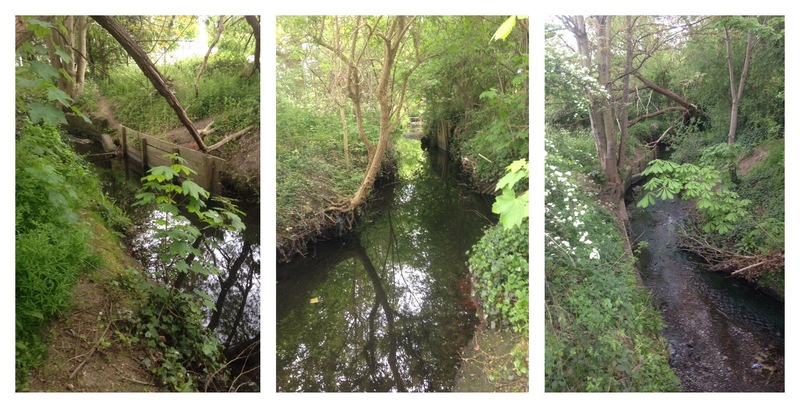 The old channel was retained for extreme flood situations and flow can be switched to it when the storage in the park is full (above, right photograph). 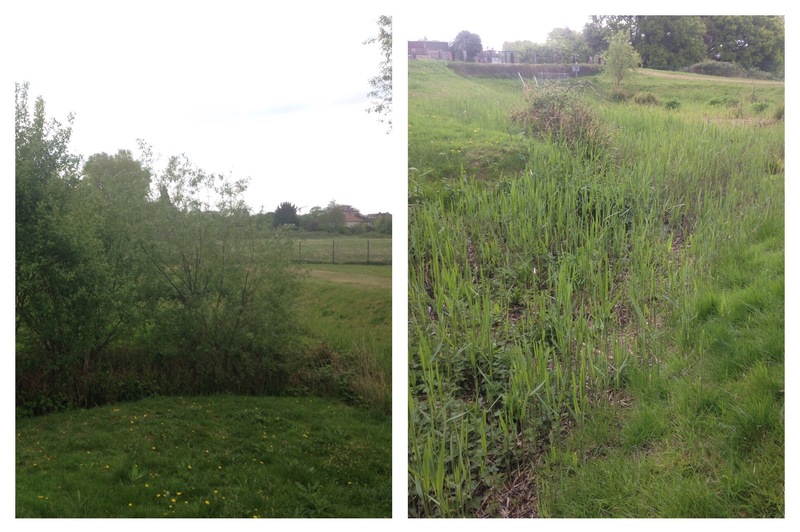 The park which used to be rarely visited other than for weekend football is now a well-used focal point and reconnecting the community with the river and its natural environment – it is often held up as an excellent example of urban river management. Unlike other parts of the Quaggy’s catchment, it is beginning to be used as a place of play and discovery – children can sometimes be seen jumping across the river, there were reminiscences about doing this in Mottingham, feeding ducks on the pond along with the occasional sightings of fishing nets and buckets. The Quaggy was originally joined by Well Hall Stream in the park, although when followed a while ago, there was little evidence of any current flow. 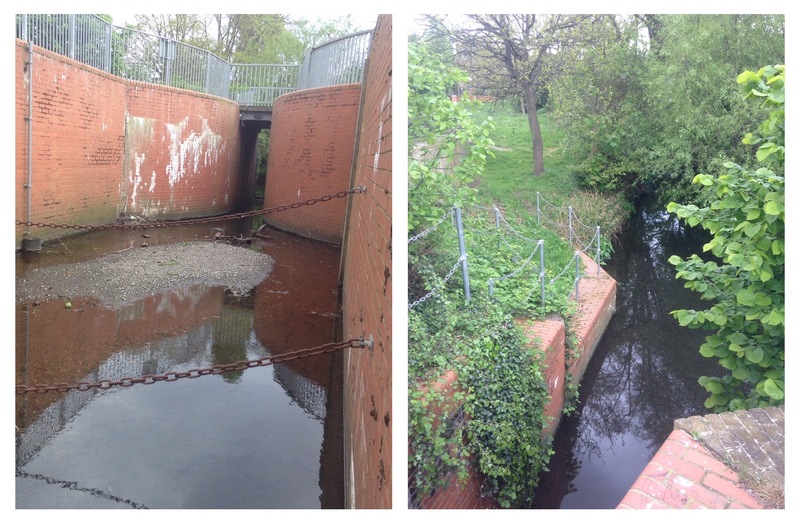 The river goes through some complex engineering that can shut off the flows in periods of high water, and re-emerges the other side of Kidbrooke Park Road in the playing fields of John Roan School. Here too the river has changed, the concrete encasement had continued west of the road, I remember having to scramble down angled concrete to fish out footballs from the river during my sons’ Saturday morning football practice there. 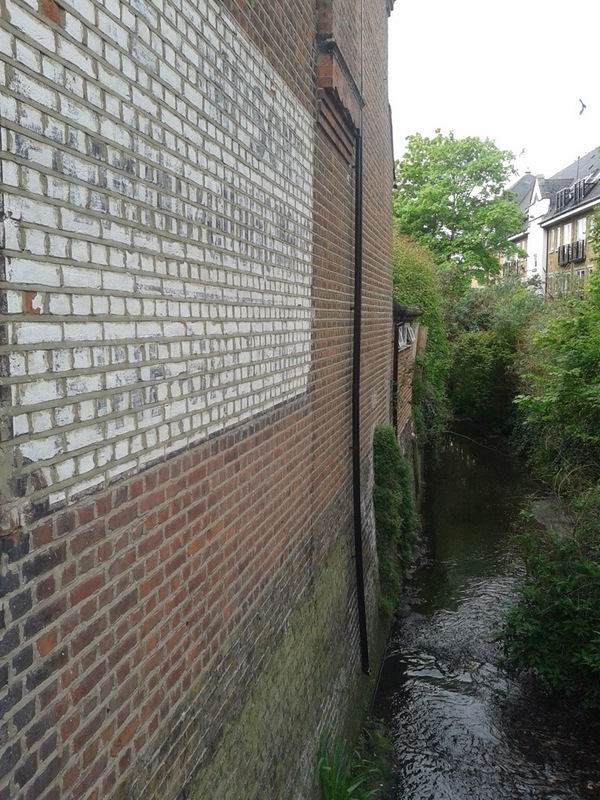 The Quaggy is theoretically joined by Lower Kid Brook (above) opposite a rather impressive Woolwich Borough marker (below left), or rather it isn’t any more – the flow was probably diverted into the Quaggy three hundred metres to the east in Sutcliffe Park. Beyond John Roan playing fields, the river is sandwiched between Lyme Farm Road estate, which replaced Victorian housing, and Crofton Albion FC. It emerges out into the public gaze again at Weigall Road where the 1903 boundary markers from Woolwich had again been busy (above right). 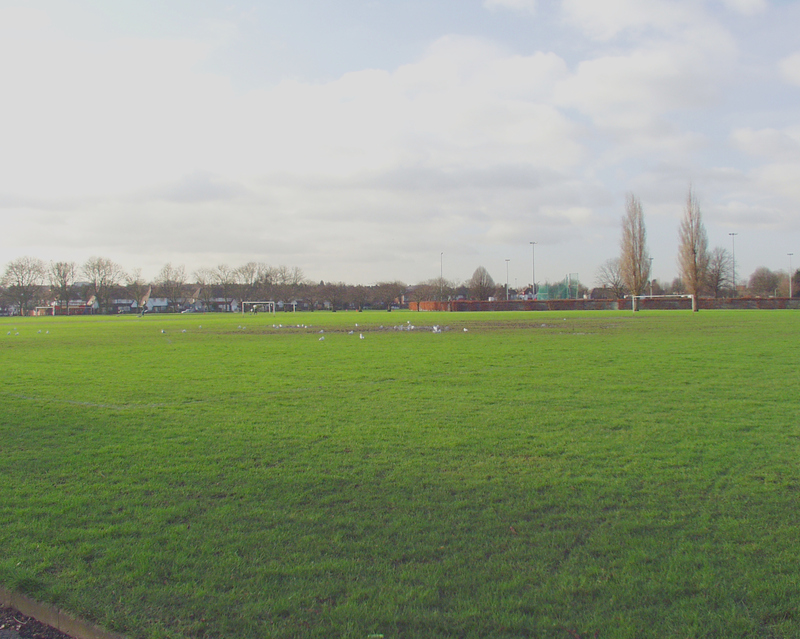 Over the road, to the south, there is another series of playing fields – the first is a public one, Weigall Sports Field which was once home to Ravensbourne Athletic Club’s grass running track. It was part of a residential club and sports centre for employees of Cook, Son and Co (St Pauls) Ltd. which was a clothing wholesale company – the building faces on to Eltham Road (see above) and was completed in 1912. Prior to then there were newspaper reports of them being based in Ladywell Fields, hence the name from a different catchment. The building on Eltham Road was requisitioned for World War 1 billeting but returned to its former use after the War. It continued as this until after World War Two when it was converted into flats – it is now part of Ravens Way (perhaps a shortening of the club’s name) (3). Its next door neighbour is the Bowring Group Sports Ground (below), although its days in recreational use are probably numbered as it seems to have been acquired for a ‘Free’ School. 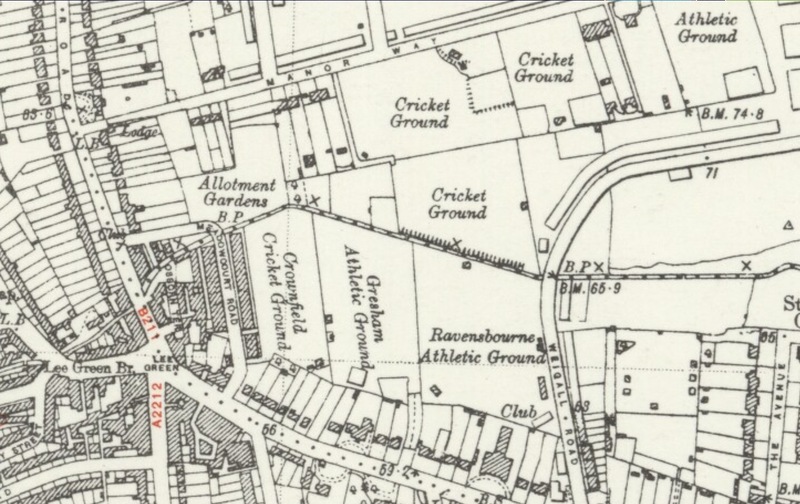 The northern banks of the Quaggy also used to have playing fields, the just post war Ordnance Survey map shows cricket grounds (on a Creative Commons from National Library of Scotland.) The outlines of the fields are still there and indeed the derelict remains of one the pavilions remains. The formerly manicured grounds have been largely abandoned and now form part of the Weigall Road flood defence and storage, although the intention has always been dual use. It isn’t meant to be an accessible area, but fences on Weigall Road and Blackheath Park are always porous enough for the runner of a smaller stature to enter without having to resort to contortions or scaling boundaries. It the last long section of the river where the Quaggy has a bucolic feel – it probably hasn’t changed much since the fields by the river were used as the venue for the horse racing of the Lee Races in the first half of the 19th century. The flood defences have a second fence to prevent the fluvial flâneur but in a period of low flow they proved to be of limited deterrent. Apparently the Weigall Road storage will hold 65,000 m³ of water. There is/was probably a small tributary joining around here. There is very boggy ground just south of the derelict pavilion, more standing water in wetter seasons but still pooling in a very dry Spring. There is an occasionally running stream which forms the boundary between the fields, in recent years I have only seen water there in the very wet winter of 2013/14. On Facebook pages relating to upstream posts, there are fond memories of playing in and on the banks of the Quaggy in these parts – there still sometime cross river swings with a ducking for those with poor grips, although none have been noticed for a year or two. Beyond the Weigall Road flood storage area, the Quaggy briefly disappears before being bridged by Meadowcourt Road and then flowing onwards towards Osborne Terrace. 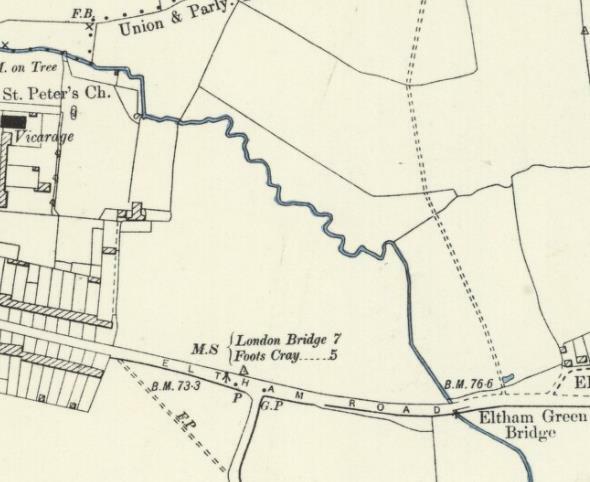 The river is then bridged by Lee Road, there was only a footbridge until as late as the 1860s, as the 1863 published 25″ Ordnance Survey shows (on a Creative Commons via National Library of Scotland). 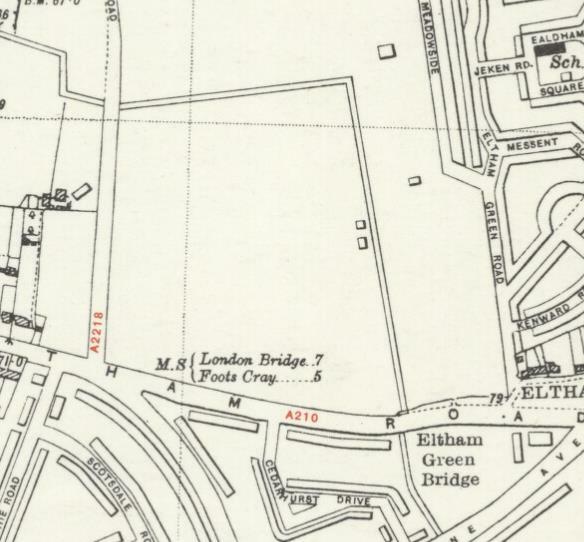 The road bridge was certainly there by the time the cartographers returned in 1893. This was an area of flooding – Hastead reported depths of 10′ (3 metres) in the 18th century and FW Hart reporting similar depths after the rapid thaw following the bitterly cold 1813/14 winter, there was flooding over a wide area including a lot of Lee Park. Hart reported flooding being a regular occurrence in the early 19th century with a Bromley farmer drowning in 1830. There is another Woolwich marker from 1903 by the bridge, only someone has chiselled out – the borough name, perhaps they were going to return and add Greenwich, but they never did. 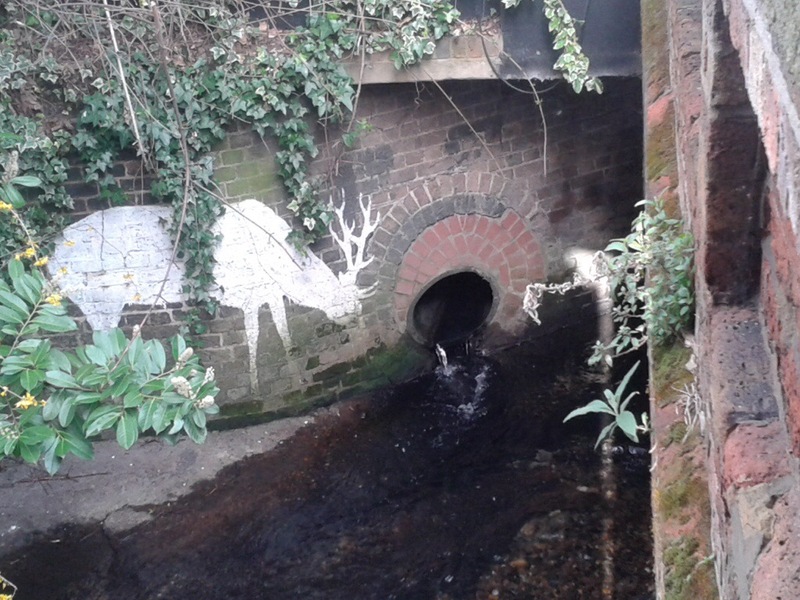 Next to the bridge there is a pipe with water entering the Quaggy, with a Lewisham Natureman stag ‘grazing’ next to it, this is the diverted Mid Kid Brook. On the opposite bank, there is a ghost sign for a ‘carver and gilder’ (more here), oddly hidden by the current cafe owners. We’ll leave the river here for another day. 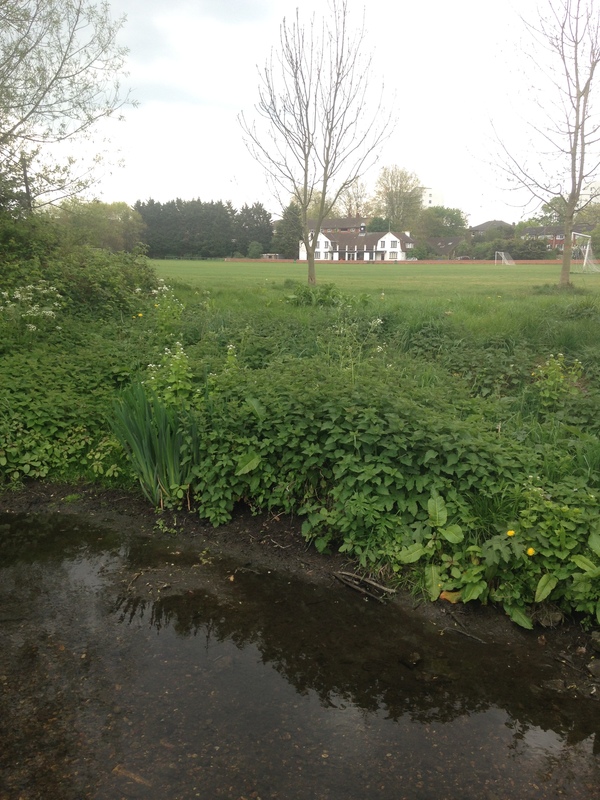 This entry was posted in Greenwich History, Lewisham History, Rivers and tagged Lee Green, Lee Road, Quaggy, Ravensbourne Athletic Club, Sutcliffe Park, Weigell Road on May 25, 2017 by Paul B.